The Cobblers have won the race to sign Rangers midfielder Matt Crooks for an undisclosed fee, which is believed to be £100,000. Crooks put pen to paper on a three-year contract at Sixfields on Tuesday morning, and has travelled with his new team-mates for the friendly at Frome Town. It has taken weeks of negotations. but Justin Edinburgh has finally got his man, with the Cobblers seeing off competition from Sky Bet League One rivals Scunthorpe United as well as other clubs to land the 23-year-old. The signing is the clearest indication yet of the increase in spending power the Cobblers now have following the investment of 5USport last month, and three more players are still expected to join before the start of the new season. Born in Leeds, Crooks began his career in the Manchester United Academy, the club he supports, before switching to Huddersfield Town where he signed his first professional contract in 2010. He made only one appearance for the Terriers, and after loan spells at Halifax Town and Hartlepool United, he moved to Accrington, also on loan, before signing on permanently at the Crown Ground on February, 2015. 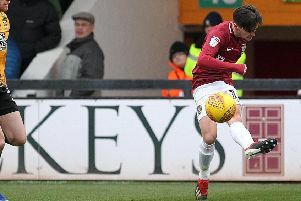 Crooks was a key man in John Coleman’s side as they just missed out on promotion from Sky Bet League Two in the season it was won by the Cobblers, and in all Crooks made 48 starts and five substitute appearances for Stanley, scoring eight goals. In the the summer of 2016 Crooks and Stanley team-mate Josh Windass both made the move to Ibrox, with Rangers Manager Mark Warburton picking them up for a cut-price £60,000 apiece under FIFA regulations as they had both signed pre-contract agreement with the Scottish club. An ankle ligament injury suffered prior to the start of the season meant the player was always playing catch-up at his new club, and he only made one start and two substitute appearances for the Light Blues. Desperate for game time, Crooks joined Scunthorpe on loan, making his Iron debut in their 2-1 win against the Cobblers in January, under the watchful eye of newly-appointed Cobblers boss Edinburgh. Crooks scored three times in 12 games for the Iron and was a big hit at Glanford Park, before a ligament injury in his left knee brought a premature end to his campaign. With Warburton leaving Rangers while Crooks was out on loan, and Pedro Caixinha taking over, the player found himself surplus to requirements as the Portuguese rebuilds his squad, and has decided his future lies at the Cobblers. Crooks has travelled with the rest of the squad for Tuesday’s friendly at Frome, but it’s not clear whether he will take part in the game or not.